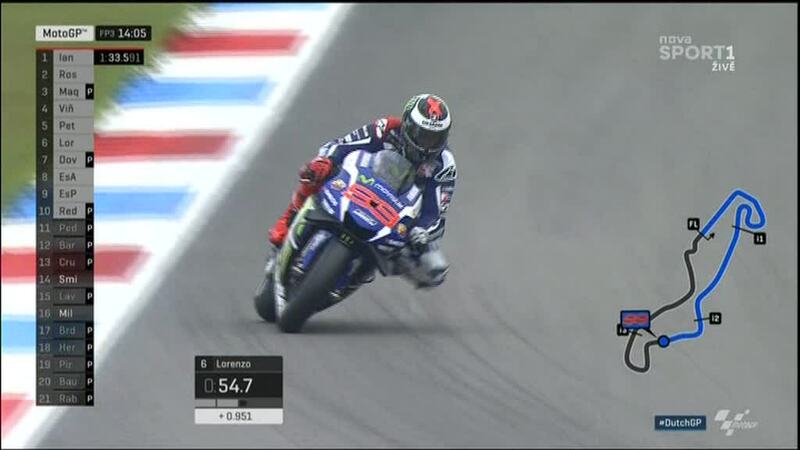 An eventful Free Practice 3 saw Dovizioso grab the top spot as Lorenzo just squeezes into the top ten. Dry conditions in Free Practice 3 gave several MotoGP™ World Championship riders, such as Dani Pedrosa (Repsol Honda Team), a much needed chance to improve their time and get inside the top ten. In a classic Assen weekend riders would be getting ready to race, but the 2016 edition of the Motul TT Assen is the first time the race will run on Sunday. Times remained largely unchanged for most of the session. Once riders began to push the times came down quickly, Andrea Iannone (Ducati Team) and Valentino Rossi (Movistar Yamaha MotoGP) some of the first to improve at the top of the timesheets. Positions changed multiple times a minute, Andrea Dovizioso (Ducati Team) coming from seemingly no where to top the session with a 1’33.308. 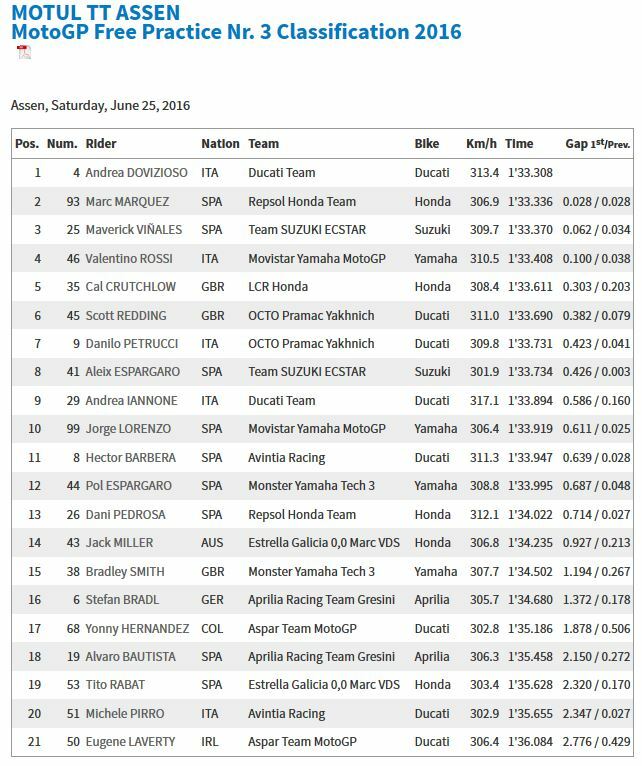 Marc Marquez (Repsol Honda Team) ended 0.028s behind the Italian, the top four all within just 0.1s of each other. 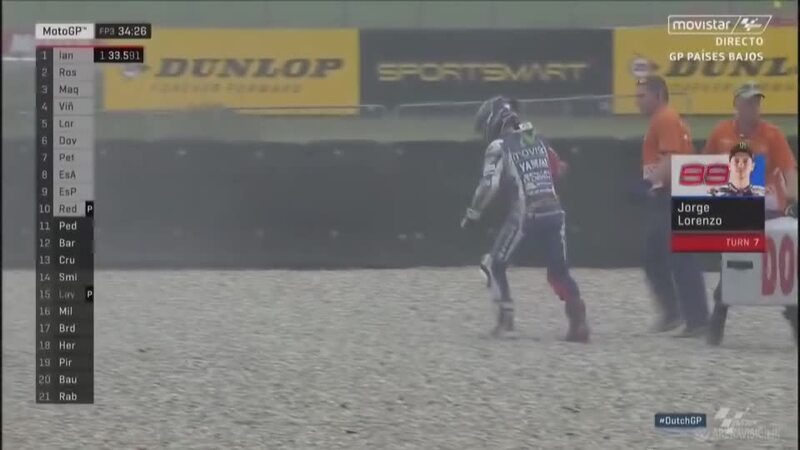 Conditions proved treacherous for a number of riders with multiple crashes and moments during the session. 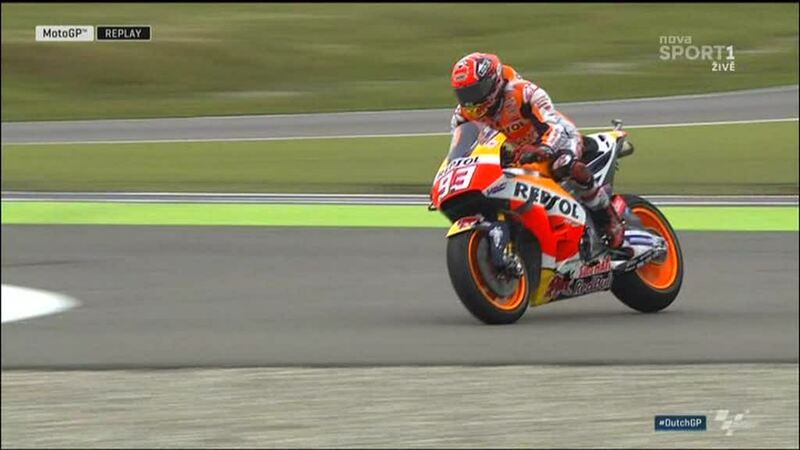 Marquez did an incredible job to hang onto his RC213V after a moment heading into Turn 1. 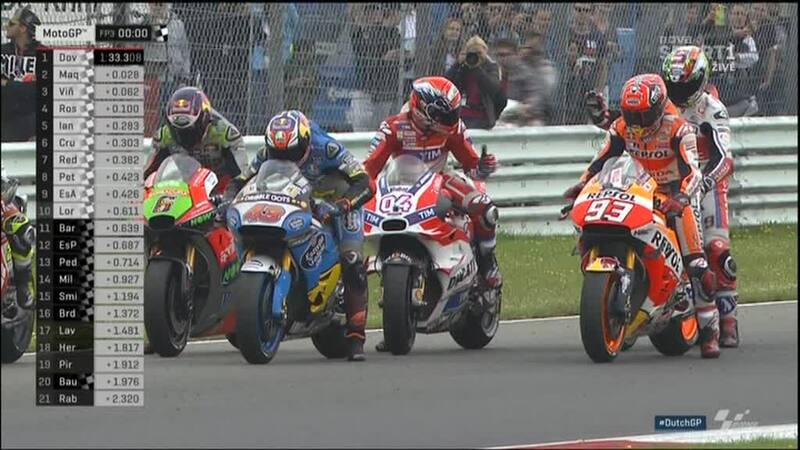 There were once again three different manufacturers inside the top three as Maverick Viñales (Team Suzuki Ecstar) was at his best once more.The future Yamaha rider was under 0.4s quicker than his teammate Aleix Espargaro (Team Suzuki Ecstar) but Espargaro was down in ninth. He was only 0.1s slower than Andrea Dovizioso, but a 1’33.408 still saw Rossi down in fourth, the only Yamaha inside the top five. 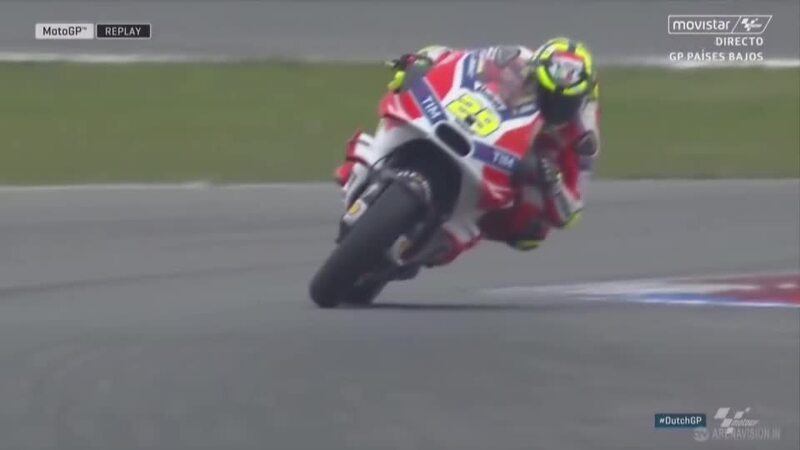 He was closely followed by Andrea Iannone who completed the top five. Iannone was the only rider in the top ten unable to improve his best time from Friday. Cal Crutchlow (LCR Honda), Scott Redding (Octo Pramac Yakhnich), Danilo Petrucci (Octo Pramac Yakhnich) and Aleix Espargaro all secured themselves passage into Q2 with a place inside the top ten. 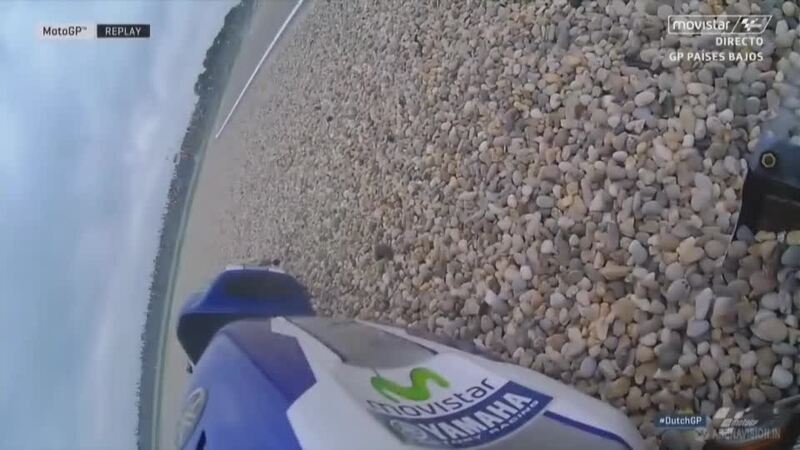 Jorge Lorenzo (Movistar Yamaha MotoGP) suffered a fall at Turn 7 quite early in the session. 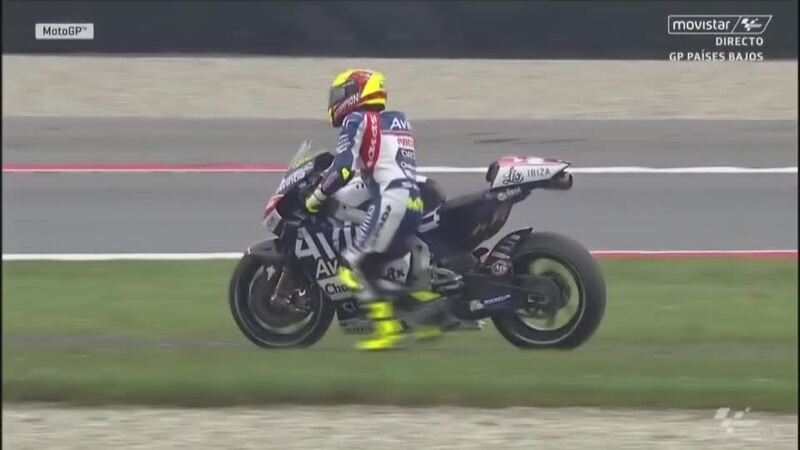 He took a heavy fall but was soon back in his pit box. The fall occurred on his M1 with the new frame, the Majorcan only able to use the older style frame for the rest of the session. 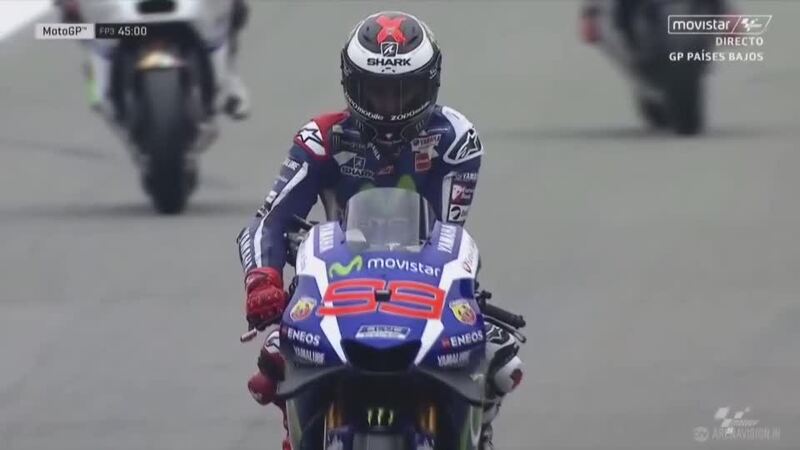 A 1’33.919 after his crash allowed Lorenzo to just squeak into the top ten. Unfortunately Dani Pedrosa was unable to improve his time enough and will have to contest Q1. Turn 7 also saw Pol Espargaro (Monster Yamaha Tech 3) fall, an almost identical crash to that of Lorenzo just a few minutes before. 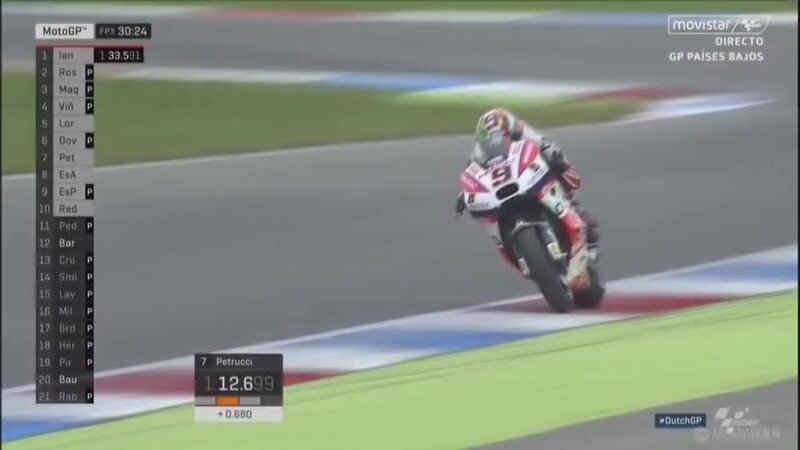 As the final ten-minute shootout began, Michele Pirro (Avintia Racing) crashed at Turn 1 and was quickly followed down by Eugene Laverty (Aspar Team MotoGP) who came off at Turn 16. 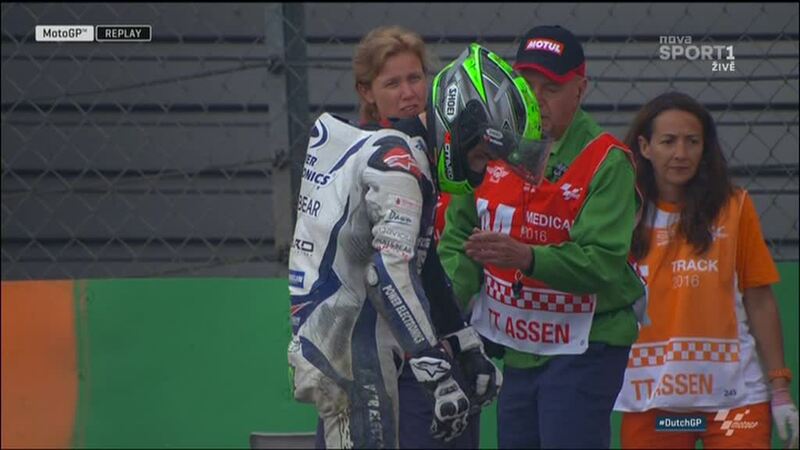 Laverty’s teammate Yonny Hernandez (Aspar Team MotoGP) fell not long after, again at Turn 7.